The artist is not a person endowed with free will who seeks his own ends, but one who allows art to realize its purpose within him. Where have I been and what have I been doing? First, I have been recovering from the cancer and it's treatment. Second, my mother was very ill and in need my attention. I am rather confused by the new economy and where I fit into it, as many of you may be. I am just realizing that I had cancer for a year. Wow. Cancer. I just went through it and now it registers. I don't know what that's about. I want to continue with my doll network but it seems to have slowed down so much that it is not profitable any longer. Is it me? Should I be offering more? Should I teaching somewhere else? Should I be teaching at all? Dissappointed by students who decided to take what they learned from me and teach it themselves, calling it their own. Selling the dolls they learned from and not giving me credit for the design. Charging alot more than I do for the classes I might add. Is that how it is supposed to work? I'm not sure. 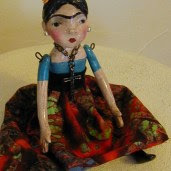 Nancye you have accomplished alot, by surviving cancer, and the beautiful dolls you create. Unfortunately you are not the only one being copied. I can easily recognize an artist's work online, and I know exactly who they got lessons from. That's the thing about teaching your skills. People take those skills and don't bother to incorporate them into their work, they simply use them exactly as they were taught. I can imagine how frustrating it would be to see your work being taught by others, but hopefully people will be able to see through them. I don't know what you can do about your copycats, I'm sorry you have to deal with unethical people. I know you will figure it out. I loved the little doll tutorial, if that helps at all. You've beaten cancer; so in other words you have a "new" life to look forward to. Why not go in a different direction. Take some time off; relax, re-energize and think about what & where life can take you. Art & creativity is all very well but it has to mean something & bring satisfaction. I'm so sorry but you're a survivor. You'll be OK once you regroup.